Not so long ago, Singapore was the chewing gum center of the world. More gum was produced in Singapore than anywhere else, and Singaporeans chewed their way through more of the stuff than any other nation. The situation was pretty crazy. People chewed gum at work. People chewed gum at home. Many people went to sleep chewing gum. Children and adults chewed. Most of the animals in the zoo chewed. Chewing gum was even a major ingredient in Singaporean cooking. There was a myriad of chewing gum colors, flavors and textures. Spearmint, mango, curry chicken, beef noodle and durian. Gum that could be chewed for a whole month without losing its taste. Gum that dissolved quickly and made your tongue frigid cold. And the world-famous Singaporean dragon mint chewing gum that made small mint-scented flames come out of your nose and mouth. All of this gum consumption meant that there was a huge gum producing industry in Singapore. Vast plantations of rubber trees swathed the island like swirling green robes. And the creamy latex harvested from these trees flowed through a network of gleaming metal pipes into the gum factories. Most of the people living in Singapore also grew rubber trees in their gardens and on their balconies. Each day they would milk their trees just like cows and then sell the precious latex to rubber collectors. The rubber collectors traveled round Singapore in red and white milk floats – with bottles of white latex on the back instead of milk. And, because they looked so much like milk delivery men the rubber collectors were generally known as ‘milkies’. One milkie was a young man called Edmund Wong. Edmund was 22 years old and he had just bought his second milk float. The first had been purchased with a loan from his uncle who owned a shop selling tropical fish. (Most Singaporeans have an aquarium at home because they believe that fish bring good luck – so this is a good business to be in). Edmund was cheerful and hard working, and he always slightly over estimated the amount of latex that his customers gave him. So he soon had a large network of houses that he collected latex from each week. Edmund’s second milk float was brand new and it had just arrived on a ship from England. It had been built in the northern industrial city of Newcastle and four weeks after leaving the cold drizzle of England it now sat gleaming in the tropical Singapore sunshine. Singapore is the busiest port in the world and thousands of containers were being moved about like pieces in a giant puzzle as Edmund stood sipping sweet Singapore coffee. “Have to wait much longer, lah?” Edmund said to the customs official who was overseeing the ship unloading. “Why hurry, lah? You milkies always rush rush. Have any gum?”. Edmund offered the customs official a piece of fizzy curry sea creatures gum in the shape of an octopus. This was a new type of gum. Each piece was shaped like a different sea creature, and tasted like a curry made from that that creature – but also fizzy. Milkies always managed to get the new flavors early through their contacts at the factories. “No hurry, lah. But have to get home before dark”. “Having dinner with girlfriend’s parents. We are planning our wedding”. Edmund’s business was going well. But he had been saving for three years to pay for the wedding. Singaporean weddings are very lavish affairs. Several hundred guests are invited to a sumptuous banquet at a five star hotel and, even though the guests give small red packets containing money (called ‘hongbao’), it still works out to be very costly for the couple getting married. Edmund watched as another customs official walked around the milk float. He kicked the tires, looked underneath and then finally sat in the open cabin at the front. “All look OK!” he announced without looking up and started scribbling on a thick wad of multi-colored, official forms. “OK, take her away” the first official said to Edmund. “Have one more piece of gum?”. Edmund handed over the rest of the fizzy curry sea animals. Then he stepped into the open cabin and drove off. Later that night Edmund was passing round chocolate mint-flavor chewing gum to his future wife’s family as they all sat around after dinner. “You heard about bubble competition?” the youngest brother of Edmund’s future wife asked suddenly. “Bubble competition?” his mother replied. “Chewing gum competition. Who can blow the biggest bubble. Winner gets a new Mercedes!”. “Friend of mine is making new gum especially for big bubbles” Edmund wondered aloud. The same friend who gave him the fizzy curry sea animals gum was also working on a new big bubbles gum. “New Mercedes would be just nice for you Mrs. Tan” he said to his future mother in law. “I think I will try to win for you”. His fiancé’s mother smiled happily and wondered how many grandchildren they would have. 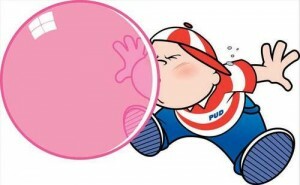 On Saturday morning Edmund was to be found amongst the other competitors in the bubble blowing competition. Quite a number of people had entered the competition and they were all gathered on the Padang – a luscious green playing field in the middle of Singapore’s business district, surrounded on all sides by grand and famous buildings. The Padang has been a sporting battleground for many years. And, nowadays you can wander by after work in the evening or during weekends and watch teams of people from all over the world playing fiercely competitive games of football, cricket and rugby. The day before the competition, Edmund had met for coffee with his friend who worked as a chemical engineer at one of the leading chewing gum factories. His friend had given Edmund a packet of the new big bubbles gum he was developing. “You should do pretty well with this” he said, “contains some special ingredients!” Then, he added “Gum is not completely finished yet. I think it should be OK, but be careful”. “What could go wrong?” Edmund asked. “Don’t know” his friend said. “Testing not complete. But best not to use more than one piece at a time”. Edmund was only thinking of the new Mercedes and quickly forgot what his friend had said. Now the Minister for Chewables appeared on a stage, with judges, sponsors and various officials next to him. The minister surveyed the crowd and smiled. Then he nodded to some of the officials and raised a megaphone to his mouth. Edmund looked around at the other contestants. Some of them had friends massaging their cheeks while they chewed. Other contestants were pouring mixtures of colored powders and liquids into their mouths. Edmund popped a piece of the big bubbles gum into his mouth and started to chew. The gum tasted horrible – like a mixture of car tires and seaweed. And, it was very fizzy – Edmund could feel bubbles forming and bursting on his tongue. After chewing for a few minutes, Edmund decided he still had room in his mouth and so he popped in three more chunks. He suddenly remembered his friend’s warning. But what could happen? It was only chewing gum. Plus, he really wanted to win the Mercedes for his future mother in law. There were two more pieces in the bag – so he quickly put them in his mouth as well. Other contestants had started blowing their bubbles. Many bubbles collapsed immediately and covered the blowers’ faces in a rainbow of sticky colors. But some people were making quite good progress. And, breath by breath, puff by puff, a multitude of colorful bubbles slowly started sprouting from the mouths of the competitors. Edmund’s first puffs did not achieve anything. The gum was really tough and his mouth was full. But, after much maneuvering he finally managed to soften the gum and get it into the right position. And, straining with all his muscles, he started to blow. Slowly he felt a small bubble ooze out from between his lips and tremble in the breeze. It was very hard work and Edmund began to doubt whether the gum formula was right. If they really had used car tires to make this stuff then they had put far too much in. But suddenly something very strange happened. The little bubble shivered and twitched as if it was alive – and then started to grow by itself. Even without blowing Edmund could feel the bubble expanding. Gum was slowly being drawn out of his mouth and the bubble started getting bigger and bigger. Soon, Edmund could see the bubble out of the corners of his eyes. Then, a few minutes later, the bubble was as big as a watermelon and he had to roll his head back so it would not touch his nose. Then, the bubble was as big as a jackfruit and Edmund decided to lie on the grass so that it could carry on growing unobstructed. Many competitors standing near Edmund were so amazed that they lost their concentration and their bubbles collapsed. Soon, a crowd had gathered around Edmund. Or rather, around Edmund’s bubble – because now the bubble was as big as a car and Edmund was completely hidden underneath it. Edmund was lying on the grass as the bubble grew over him. He could see strangely formed shadows through the bubble’s translucent skin and he could hear muffled voices. He was pretty sure that his bubble must be one of the biggest. But no-one was telling him to stop. Maybe there was another person with special gum and they were both still in the competition? He could not be sure. However, he was not in any real discomfort yet so he decided to just stay put and let the bubble carry on growing. Then suddenly Edmund felt his head bounce gently on the grass. At first, he thought that it was just the wind blowing the bubble back and forth. But then his head was slowly lifted up, followed by his shoulders, upper body, and finally his legs. Within a few seconds Edmund was standing – with the bubble looming above him. Quickly Edmund grabbed the bubble with his hands and tried to puncture it. But it was far too tough and his hands bounced off harmlessly. Then he tried to spit all the rest of the gum out. But it had expanded so much that it was completely wedged into all the corners of his mouth. Straining to turn his head, Edmund could see that a crowd had gathered around him and his bubble. “Help!” Edmund tried to shout. “The bubble is out of control – try to puncture it!” But no-one could hear or understand his muffled cries. Instead, the crowd started clapping and cheering as the bubble grew bigger and bigger. Then, all of a sudden, there was a hush. And that coincided exactly with the moment Edmund had been dreading. He felt his feet leave the soft grass of the Padang – and then he was airborne. The people nearest to him hesitated for a few seconds. Then several of them lunged forward and grabbed Edmund round the legs and waist. This stopped his ascent briefly – but, after a few seconds the bubble kicked mischievously and Edmund plus his passengers begin rising together. Somewhat understandably, the passengers were not happy with this rising into the tropical blue sky and so they quickly let go – the last one shouting “I’ll call the fire brigade!” as he fell back to earth. But, the fire brigade would not be able to do anything as Edmund was soon floating far above the reach of any ladders. Over the next two days Edmund’s bubble expanded until it covered most of Singapore. It lurked menacingly over the island like – well, like a giant pink chewing gum bubble. The whole country was bathed in a translucent pinkish light and the air smelled of car tires and seaweed. The country came to a very un-Singapore-like standstill. The normally busy international airport was silent as no flights could take off or land. The police closed off most of the roads to prevent accidents. People at work spent their time discussing what might happen and gazing up at the bubble through their office windows. Singapore’s parliament debated long into the night on what to do. The military proposed building a battery of gigantic fans, blowing the bubble out to sea and then shooting it down. A marketing agency suggested that the bubble should be promoted as a new attraction and tourists charged to ride hot air balloons up to see it. Then, on the Thursday after the bubble blowing competition, a huge, black tropical rain cloud rolled angrily in over Singapore. The dark cloud loomed above the pink bubble like a whale eying up a small fish. And at exactly 3pm the heavens opened up with an explosion of thunder and lightning. Initially it was rather strange because the bubble was like a giant umbrella. You could see blurred streaks of lightning through the translucent skin – but the thunder was muffled and most of Singapore stayed bone dry as the rain flowed over the bubble and into the sea. But then a huge gleaming jagged streak of lightning leapt from the rain cloud and pierced the bubble’s pink flesh. The crowds of people gathered below emitted a collective “Ooh” as if they were watching a fireworks display. Then there was a loud burping noise as the bubble burst… and a million bits of sticky pink chewing gum came raining down on Singapore. You can probably imagine the mess. Imagine what its like after a snowstorm, torrential rain storm, a furious sand storm or even a heavy fall of autumn leaves. Then swap the combined snow, rain, sand and leaves for a sticky mass of slightly toasted, sticky, pink chewing gum (smelling of car tires and seaweed). Imagine the trains stuck to the tracks. Imagine the skyscrapers slathered in gum, citizens trudging through knee-high gum drifts and thick skins of gum stretched across swimming pools. So, that’s why chewing gum is banned in Singapore. (You are probably wondering what happened to Edmund? Well, he managed to hang onto the bubble all the way until the end. And, luckily for him, when the bubble collapsed he was floating directly over the McRitchie reservoir. He plummeted into the deep waters, swam ashore and sneaked home. And, nobody ever found out).